The Falcon Hotel has a superb traditional restaurant, a comfortable brasserie lounge, a cosy bar offering traditional ales, and beautiful oak beamed private dining rooms. In the winter the cosy wood-burning fires welcome you, whilst in the summer the idyllic gardens are perfect for a spot of afternoon tea. 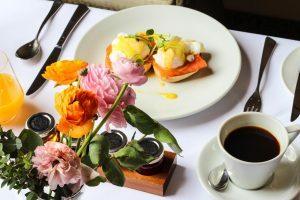 Fancy Breakfast…..for the best breakfast in town visit our partners at The Falcon Hotel, just a short walk for your perfectly cooked full English or fresh contintental breakfast in idyllic surroundings. Need Lunch or Dinner…..From a great selection of starters, great British classics and food from the county you will no doubt take some time to decide what to eat, so why not start by looking at the menu’s for The Falcon Hotel and Don Paddy’s. Why not spoil yourself and have afternoon tea…..The Falcon epitomises taste and tradition. 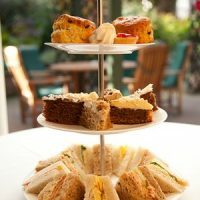 Expect fancy cakes, finger sandwhiches, homemade cakes and patries, clotted cream, complemented by pots of English Tea or a Cafetiere of Coffee. Feel the need for some pub grub and real ale…..For traditional real ale and great pub food your choice should be to visit The Vaults with exceptional staff and a wonderful atmosphere. A traditional English pub to the very core.